The Motley Fool Canada » Energy Stocks » Enbridge Inc. (TSX:ENB) Stock Is Soaring: Is Now the Time to Buy? Enbridge Inc. (TSX:ENB) Stock Is Soaring: Is Now the Time to Buy? Enbridge Inc. (TSX:ENB)(NYSE:ENB) has been struggling for most of the year, although it looks to finally be picking up some much-needed momentum. 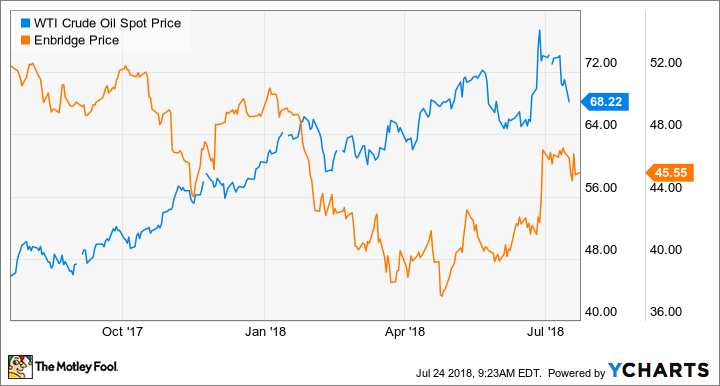 The pipeline stock is down more than 13% in the past year, although it is starting to turn things around, as the share price is up more than 14% in the past three months alone. What’s behind the recent rally? It’s an odd trend to see given that you’d normally expect oil and gas stocks to rise with the commodity, but it just highlights how different the landscape has been here in Canada than for our neighbours to the south. Political issues have led to pipelines being delayed or cancelled, and the overall outlook for the industry remains cautious. Alberta is still recovering from the downturn, and while things have improved, it’s still nowhere near where the industry was four years ago. What’s given Enbridge’s stock some life is the news earlier this month that the company’s Line 3 replacement project overcame its last big hurdle, which gave the stock a big boost. The last time the share price was trading at around $45 was back in January of this year. How much higher can the stock go? With a price-to-book ratio of only 1.4, Enbridge is still a very cheap stock given the potential that it has over the long term. And while its price-to-earnings multiple of 33 is a bit high, that ratio would be a lot lower if not for a recent quarter that saw a big asset write-down take a big chunk out of the company’s earnings. Poor results like that haven’t been typical for the company, as Enbridge has been able to perform well even during the downturn, recording a profit in each of the past five years, something not many oil and gas stocks can claim. Enbridge provides investors a lot of stability in an industry in which stability is often hard to find. The stock is still undervalued, and I can foresee it rising back up to around $50, where it did appear to have strong support until this past year. Dividend investors might want to scoop up the stock before it continues to rise and lock in its attractive 5.8% yield, which is the one area that’s benefited from the decline in share price. Although it looks like things should be getting better for Enbridge, the danger with stocks based on commodities is that we could see oil prices put a damper on any rally. Oil prices have started to decline recently, and if that trend continues, bearish investors may simply overwhelm any optimism for the stock. While there is some risk involved with Enbridge’s stock, the company’s ability to perform well even during a very challenging downturn suggests that it’s a company that can handle a lot of adversity, which makes it a very appealing buy for the long term.